People from New York City love to brag about their water. Several times I have been in the middle of complimenting some sort of city-food, and the city-dweller feels compelled to drag water into it. 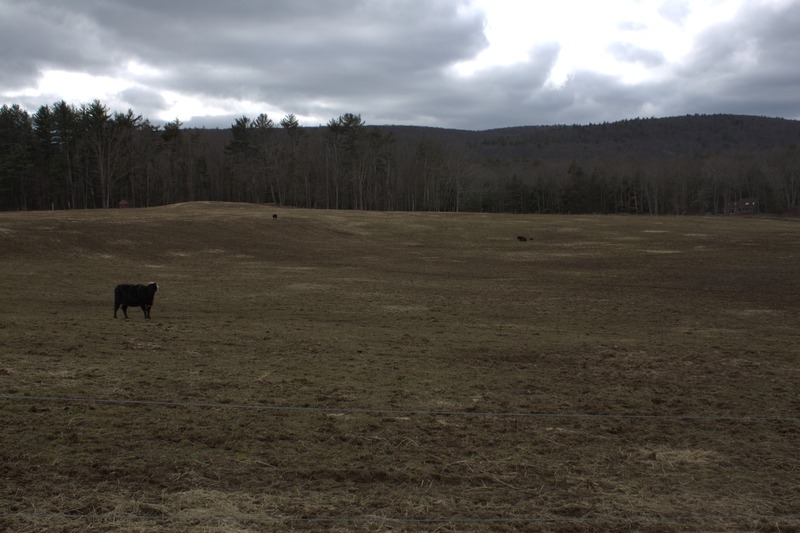 This really pisses off some people from the Hudson Valley because…guess where that delicious water comes from? No, not from the East River. No, idiot, not from New Jersey or Long Island. It comes from a series of reservoirs in the Hudson Valley, one cluster sitting in Westchester County, the much larger cluster sitting in the mid-Valley region. Although these clusters are much closer to us, we do not get to taste their loveliness. We are left sucking on what’s left behind. my well spits out something a molecule away from formaldehyde. It kind of tastes like intense mildew, but the kind of mildew that has somehow sprouted on Iron. The water is so unappetizing and noxious that my housemates devised an alternate source. The fountain is located in Western Kerhonkson, about 45 minutes from my house in New Paltz. McWilliams, one of my housemates, had found out about it from who-knows-where…the location is very off-the-beaten-path, and doesn’t seem to be listed anywhere in Google, which is pretty much like saying no public knowledge of it exists. 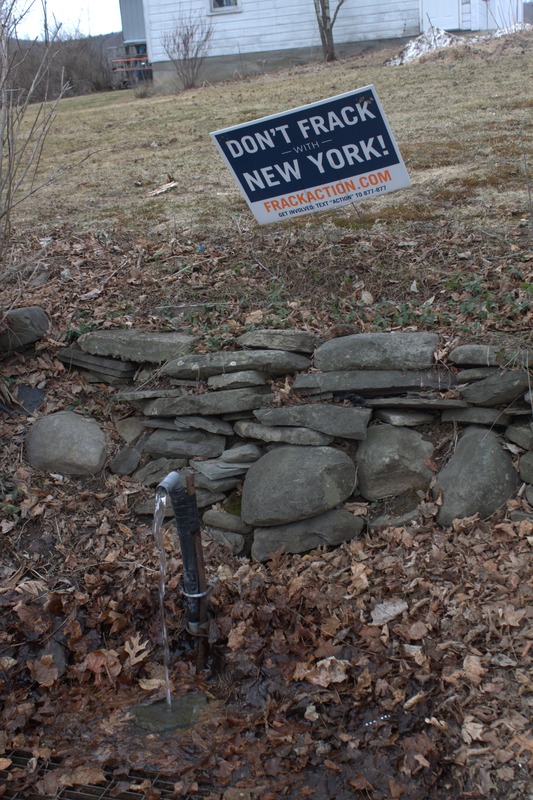 McWilliams told me it was the purest aquifer in New York State. The tales made me think of the aquifer as The Fountain of Youth. If McWilliams is any indicator, then it certainly is—he drank the fountain-water every day, and I had to be convinced that he was indeed 42, and not somewhere in his late 20s as I suspected. The source is near the intersection of Cherrytown and Upper Cherrytown roads. We were lucky to be the only ones there; McWilliams said that there’s often a long line of cars waiting for the fountain. We had brought enough containers to transport about 75 gallons of water (or 680 pounds). We started filling them up when the keeper of the fountain, an octogenarian named Sis, crept out of her house to see what the business was about. Sis was a huge fracking opponent, and spent much of her retired life campaigning against the issue. She mentioned that she was in a perfect position to do this; when people commented on how delicious the water was, she would simply state that it would turn into a chemical bath if fracking were to ever enter the state. “My husband doesn’t drink water, though,” she said. After letting this information loose on our ears, she mentioned her belief that the fountain ran ‘crystal’ or ‘cluster’ water. Cluster Water (I looked this part up) occurs when different water molecules are connected by hydrogen bonds. According to my research, cluster water has not been found in nature, and has only been formulated in obscure laboratory settings. Hey Roger Gilson. Please shut down your site. The locals hold many of these places you report on close to their hearts. These are sacred places and the more humans coming in contact with them the more destructed they become. I have witnessed this area become over used and downright abused. Tread Lightly as if you never exsisted. This area cannot tolerate more and more and more and more human activity. Have no more babies. The earth just can’t handle it and this area certainly does not need your commentary on every inch of this beautiful Temple. Please get lost! Thank you for being reasonably polite in your response, because your misgivings are not illegitimate. I had the same misgivings when I thought of starting the site, and put it off its creation for some time because of them. To combat citidiots from stomping all over the verdant valley, I decided to not give the locations of the more secretive places (about half of them), or to only indicate where they are through a series of short video clues (see Massive Caves in the Hudson Valley) that could never be interpreted by anyone without expensive personal knowledge of the area, AKA a local. The locations of the other half can already be found in seconds by Googling them (as well as a few of the places whose locations I did NOT reveal), and some of the places (Catskill Animal Sanctuary, Win’s Castle, Cabaloosa’s, The Skydiving Ranch, ect) are businesses that have no problem with some free promotion. Also, I plan to focus on more-traveled places as the site grows, since a more clicked-on site will be able to compete better on topics and locations which are already written about. In other words, I feel you, and I love the Hudson Valley too—enough to spend a chunk of my time creating a website about it. I’m not planning to stop, but I will continue to protect the more sacred places as I have been doing. Most people don’t want travel plans. They just want to be distracted for a few moments by something interested while online.